Jakob Arjouni is best known for his detective fiction, set in his native Germany but featuring a Turkish protagonist, Kemal Kanyankaya. 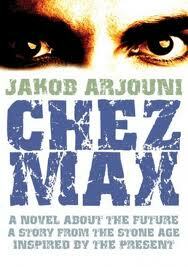 Chez Max, however, is a stand-alone novel of quite a different genre, set, as it is, in the year 2064. Arjouni’s aim is to present the future he sees arising from the terrorist attack on the Twin Towers. Originally published in 2006, he follows the repercussions of what he clearly sees as a decisive moment in history through the invasions of Afghanistan and Iraq into a future in which America is weakened and the strongest power block is a Euro-Chinese Confederation. Unfortunately Chen is also arrogant, independent-minded, disparaging (particularly of Max) and argumentative. In another novel, he would be the hero – but not here, perhaps because he is not representative of the society Arjouni is depicting. When Max discovers the merest suggestion that Chen may not be as trusted as he always assumed, he decides to take advantage of this in any way he can. Probably more popular is the sexomat, the workings of which are largely, and wisely, left to the imagination. Credibly, though rather unsettlingly, it comes equipped with a camera you can use to film individuals for later ‘use’. Perhaps this is a dig at the artist’s need for suffering to promote creativity, but it has the effect of undermining the one piece of satire that remains effective by the novel’s conclusion. An entertaining enough read, but ultimately unsatisfying. You are currently browsing the archives for the Jakob Arjouni category.